Objectives: To update the EULAR recommendations for management of knee osteoarthritis (OA) by an evidence based medicine and expert opinion approach. Methods: The literature search and guidelines were restricted to treatments for knee OA pertaining to clinical and/or radiological OA of any compartment of the knee. Papers for combined treatment of knee and other types of OA were excluded. Medline and Embase were searched using a combination of subject headings and key words. Searches for those treatments previously investigated were conducted for January 1999 to February 2002 and for those treatments not previously investigated for 1966 to February 2002. The level of evidence found for each treatment was documented. Quality scores were determined for each paper, an effect size comparing the treatment with placebo was calculated, where possible, and a toxicity profile was determined for each treatment modality. Results: 497 new publications were identified by the search. Of these, 103 were intervention trials and included in the overall analysis, and 33 treatment modalities were identified. Previously identified publications which were not exclusively knee OA in the initial analysis were rejected. In total, 545 publications were included. Based on the results of the literature search and expert opinion, 10 recommendations for the treatment of knee OA were devised using a five stage Delphi technique. Based on expert opinion, a further set of 10 items was identified by a five stage Delphi technique as important for future research. Conclusion: The updated recommendations support some of the previous propositions published in 2000 but also include modified statements and new propositions. Although a large number of treatment options for knee OA exist, the evidence based format of the EULAR Recommendations continues to identify key clinical questions that currently are unanswered. Invasive interventions (for example, intra-articular injections, lavage, arthroplasty). Prevent or retard progression of the disease and its consequences. Current evidence to support the various treatments in current use, however, is very variable. Guidelines on the management of knee and hip OA have been published by the Royal College of Physicians9 and the American College of Rheumatology.10 In 1998, EULAR commissioned a steering group to review the evidence for the treatment of knee OA. Recommendations for treatment were developed as a result of this evidence based review and presented in 2000.11 These guidelines, however, were restricted to a limited number of treatment modalities and only reviewed evidence up until December 1998. We therefore have updated the recommendations by extending the literature search to February 2002 and by including all treatments used in knee OA. The members of the expert committee on knee OA reconvened in November 2001 to establish the methodology in updating the evidence base and recommendations for the treatment of knee OA. The initiative, endorsed by ESCISIT, involved a committee of experts in OA (19 rheumatologists, four orthopaedic surgeons) and one research fellow from 13 European countries. To specify 10 recommendations for the future research agenda for the management of knee OA. To maintain continuity from the previous search, Medline OVID and BIDS Embase were the databases searched systematically. The searches for those treatment modalities previously investigated were conducted for the period January 1999 to February 2002 and for those modalities not previously investigated from 1966 to February 2002. In the search strategy, all English and other European language publications in the form of systematic reviews, meta-analyses, randomised controlled trials (RCTs), controlled trials, and observational studies were included. Publications in non-European languages were excluded. All trials that assessed the effects of a treatment for knee OA on pain and/or function were included. Thirty three such individual treatment modalities were identified; NSAIDs are divided into two subsets, conventional (non-selective) NSAIDs and COX 2 selective NSAIDs (coxibs), but overall recognised as one group (table 1). For the purpose of the review knee OA was defined as patients with clinical and/or radiological evidence of knee OA. Only papers exclusively studying knee OA were included at all stages of the analysis; those combining hip and knee OA were excluded. The previous literature search included papers combining hip and knee OA in its qualitative data; these were reviewed and if the results for hip and knee OA could not be separated from one another, the publication was rejected. The methodological design of each study was scored according to a predetermined proforma.12 This methodological checklist provided a quality assessment of the information provided by each individual publication, particularly addressing study design and methodology and the statistical power of each study. Studies were scored 0–1 for 26 questions and 0–2 for one question, giving a maximum total of 28. Power calculations were scored as 1 if present and 0 if absent. If probability values were reported in the results, a score of 1 was given and 0 if absent. A single assessor scored English language publications and a second assessor validated these scores in a blinded fashion. Non-English European language publications were assessed by individual members of the EULAR steering group committee fluent in the language of the publication. All quality scores were collected and recorded centrally. Quantitative analysis of treatment effect was assessed, where possible, by calculating the effect size (ES) for validated outcome measures of pain and function. A software package was used for this purpose.13 An ES is the standardised mean difference between a treatment group and a control group for an outcome variable14—in this case, pain and function. It reflects the magnitude of difference between two groups in standardised terms and is free of units. The mean and distribution of values for the baseline placebo and active treatment, and end point placebo and active treatment, and difference from baseline to end point were tabulated for each of the outcome measures recorded. The ES and data displayed in this paper in all cases are calculated against placebo. Clinically, an ES of 0.2 is considered small, 0.5 is moderate (and would be recognised clinically), and greater then 0.8 is large. All data were collected and recorded centrally. Categories of evidence were adapted from the classification of the United States Agency for Health Care Policy and Research. Evidence was categorised according to study design reflecting susceptibility to bias. Table 2 shows the categories in descending order of importance. Questions posed by the recommendations were answered using the best evidence available. If, for example, a question could be answered by category 1 evidence then weaker design publications were not reviewed. The strength of recommendation for an intervention was graded A-D (table 3) by members of the editing subcommittee of the task force, after examination of the evidence in detail. The strength of recommendations is based not only on the level of evidence but also upon consideration of the following: the ES of the intervention; the side effect profile; the applicability of the evidence to the population of interest; practicality of delivery; and economic considerations. In this way the different treatments could be scored in a pragmatic manner more applicable to everyday clinical practice. After informing the expert committee about the results of the literature search and the level of evidence found for each treatment modality, two sets of 10 recommendations were proposed following a five stage Delphi technique:(a) the final expert evidence and opinion based recommendations for treatment, and (b) recommendations for future research agendas. Once the definitive list of the treatments and their level of evidence was communicated, the committee ranked the potential toxicity of each intervention. This was expressed as a 100 mm visual analogue scale, in which 0 was “not toxic at all” and 100 was “very toxic”. Figure 1 shows the results obtained. Toxicity profile of the treatment modalities based on expert opinion (23 experts). It was felt by members of the panel after the initial opinion had been sought that the NSAID group should be subdivided into conventional NSAIDs and coxibs. This was therefore performed at a later meeting. The researchers who undertook the literature search evaluated the level of evidence in order to answer the questions posed by the 10 recommendations for management of knee OA as proposed by the panel. 497 new publications were identified by the search strategy. Of these, 103 were intervention trials and therefore included in the overall analysis; 99 of these were intervention trials using at least one of the 33 treatment modalities identified, 3 were systematic reviews, and 1 was a meta-analysis. The previously identified publications were also reviewed and those that were not exclusively knee OA in the initial analysis were rejected. In total, 545 publications were included. Treatments that are no longer in use (for example, glycosaminoglycan polyscaccharides) were not included in the tabular analysis. Table 4 outlines the different treatment modalities with quality scores and effect sizes where they could be calculated. Table 5 outlines the level of evidence for each and also the strength of recommendation from the expert panel. A large number of trials examined NSAIDs. 135 NSAID trials were included in this analysis, but only 35 of these had a placebo arm and the ES could only be calculated in five of these. Median quality scores were much higher for the newer coxib trials than for trials investigating conventional NSAIDs. Quality scores varied enormously for many of the interventions. Those studies conducted more recently tended to be of a higher design quality. Median quality scores were highest for glucosamine and chondroitin sulphate trials and lowest for the surgical trials, tending to parallel the level of evidence found for each modality. 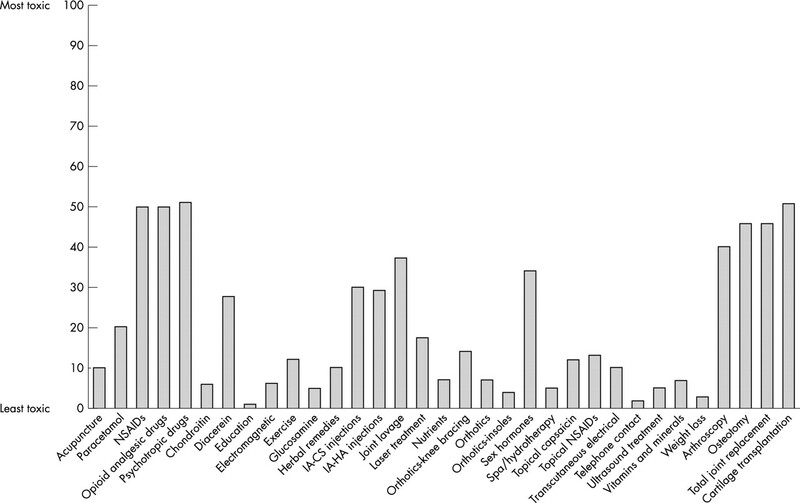 Of the 33 treatment modalities, 29 were supported by evidence from at least one RCT and were graded as either 1A or 1B for category of evidence. Of the surgical trials, only those assessing arthroscopy±debridement were supported by evidence from RCTs. NSAIDs, opioid analgesics, and psychotropic antidepressant drugs were regarded as having a similar toxicity profile in long term use to that of joint replacement surgery. When NSAIDs were subdivided into conventional and coxib groups, the results showed that the perceived mean toxicity of non-selective NSAIDs was 51 mm and the coxib mean 41 mm on a 100 mm visual analogue scale. Tables 6 and 7 summarise the final recommendations for management and future research agenda as proposed by the expert committee. The propositions are ranked in order of importance as debated by the expert opinion panel. Although this statement is logical and represents common clinical practice, there is little direct evidence from appropriately designed factorial RCTs to support this statement. There is, however, a wealth of indirect evidence from RCTs in which all subjects were receiving analgesics or NSAIDs at baseline that non-pharmacological treatments offer additional benefit over and above analgesic or NSAID usage. These have demonstrated that exercise programmes15(quality score (QS) 26), physiotherapy16 (QS 26), weight loss combined with exercise17(QS 21), education18 (QS 12), and wedged insoles19,20(QS 10, 11) offer additional benefit when used with an analgesic or NSAID regimen. There is therefore a reasonable evidence base to support this statement (1B). Location and degree of structural damage. This statement represents ideal practice and includes clinical markers that are often used to guide clinical decisions. Clinical trials predominantly investigate the efficacy of one or two specific monotherapies in highly selected homogeneous populations of otherwise fit subjects with knee OA. These data therefore are not directly applicable to the whole population of subjects with OA. Those studies that have examined the predictors of response to treatment often have limited statistical power, and therefore results are often inconclusive. An example is the presence of an effusion predicting a response to intra-articular steroids where two studies have shown conflicting results21,22(QS 22, 17). One RCT involving 84 patients confirmed short term symptom benefit of steroid over placebo and found a better outcome in those with an effusion. However, a randomised crossover study of methylprednisolone versus saline found no clinical predictors of response, suggesting that steroid injection should not be reserved just for those with effusion alone. As well as the expected relative benefits, potential dangers and costs of the intervention must clearly be taken into account. This has relevance to both medical and surgical interventions. The holistic approach to the patient is universally accepted: it has obvious validity but no research based justification specific to knee OA. Education and provision of information should form an integral part of the management of any chronic disease. This is a professional obligation and should include details of the disease, its investigations, and management. Practitioners should tailor any treatment to the individual needs of the patient and this concept can be discussed within education. Several large RCTs and a meta-analysis have demonstrated the benefits of different educational techniques in reducing pain and increasing coping skills, but with little impact on function in patients with knee OA.23 Education has also been shown to result in fewer visits to primary care and therefore also has a cost implication. In a study of 211 patients with knee OA, 80% of the costs of delivering effective self care education were offset within a year by the reduced frequency and costs of primary care visits.24 Education techniques shown to be effective include individualised education packages25 (QS 12), regular telephone calls26 (QS 17), group education27(QS 20), patient coping skills28 (QS 13), and spouse assisted coping skills training29 (QS 15). There is evidence from large RCTs that joint-specific exercises reduce pain and improve function in patients with knee OA. However, the optimal exercise regimen has not yet been determined. Exercise can be divided into joint-specific strength and range of motion exercises and general aerobic conditioning and can be either directly supervised on land or water or offered as a home based, self directed programme. A two centre RCT of 439 older patients with knee OA demonstrated that the cumulative incidence of disability for activities of daily living was lower in both exercise groups (aerobic exercise and resistance exercise) than in a no-exercise control group30(QS 24). The effectiveness of home exercise on knee OA has been explored in several RCTs, showing reduced pain scores and improved function15,31,32 (QS 26, 26, 20). Aerobic and isokinetic exercise regimens have also been effective in improving function and gait, and decreasing pain16,27,33,34 (QS 26, 20, 19, 25). No differences were found between a land based exercise programme and an aquatic programme, although both showed significant improvements in pain and function35(QS 17). Importantly, some of these studies report long term improvements (6–18 months). ES for exercise ranged from 0.57 to 1.0. One RCT in 119 patients demonstrated that the pain and function of patients with varus knee OA using a knee brace improved significantly compared with those who did not use a brace36(QS 20). An RCT comparing laterally wedged insoles with neutrally wedged insoles showed no statistical difference between the two groups. However, the group using laterally wedged insoles had a greater reduction in NSAID use together with increased compliance37(QS 25). Two controlled studies of insoles19,20 (QS 10, 11) demonstrated an improvement over an analgesic control group. A study of cross over within subjects suggested that the pain relief and improvement in function reported might be due in part to the reduced external varus moment and medial compartment load short term38(QS15). No RCTs have examined walking sticks or elastic bandage in the management of knee OA. Application of an elastic bandage in 68 patients reduced knee pain significantly in a short term study of cross over within subjects 39(QS 20). Although recommended to virtually all patients with knee OA, the relationship between weight reduction and knee OA has only been assessed formally in two studies. A large cohort study40 (QS 15) showed that weight loss reduced the risk of developing symptomatic knee OA in women. A more recent RCT demonstrated that weight loss combined with exercise reduces pain and improves function in older adults for at least six months; unfortunately, no group had weight loss alone17(QS 21). In summary, there is good evidence that education (1A) and exercise regimens (1B) reduce pain in knee OA and that exercise regimens also improve function. The use of appliances and weight loss seem sensible options in patients with knee OA, but are only supported by relatively weak evidence, with the exception of knee bracing which has level (1B) evidence for reduction in pain and improvement in function. Paracetamol is frequently used as self medication for the treatment of mild to moderate pain. It is the recommended initial oral analgesic for knee OA in published guidelines (ACR, RCP, EULAR). However, few studies have directly assessed the efficacy of paracetamol in knee OA and those that have are either of poor quality or have small patient numbers. A six week RCT in just 25 patients41 (QS 21) showed a significant improvement in pain at rest with paracetamol compared with placebo. One four week RCT showed that paracetamol 4 g/day was as effective as ibuprofen (up to 2400 mg/day)42 (QS 26). Re-evaluation of these data demonstrated that even severe knee pain responded equally to paracetamol and ibuprofen43(QS 17). Another RCT showed that paracetamol could be used effectively in doses of up to 2600 mg/day for two years without significant adverse outcomes; it also showed that the efficacy of paracetamol was similar to that of naproxen 750 mg/day. This study had a high rate of withdrawals in both treatment arms, and the authors suggested that neither drug was satisfactory for the treatment of OA44(QS 23). The issue of efficacy is clouded by the fact that most RCTs use paracetamol as escape analgesia, converting monotherapy trials to partial adjunctive studies. There are few drug interactions and no common contraindications to the use of paracetamol, including in the elderly. In summary, there is evidence (1B) that paracetamol is effective in the treatment of knee OA and that in many patients it is comparable with ibuprofen in the short term and almost as efficacious as naproxen. There is also evidence (1B) that paracetamol can be taken safely over the long term. Clearly, a drug that is both safe and commonly effective should be considered early in the management of knee OA and, if effective, as an integral component of long term pain control. There has been much recent controversy about the gastrointestinal safety of paracetamol, particularly as compared with NSAIDs. A recent editorial covers this issue well, with a review of the current available literature.45 It concludes that currently the weight of clinical evidence supports the better overall gastrointestinal safety profile of paracetamol compared with non-selective NSAIDs. Topical capsaicin (a treatment which reversibly desensitises nociceptive C fibres by acting on the VR-1 vaniloid receptors) is increasingly used in OA. There is good evidence for its efficacy in knee OA from an RCT, and it would appear its efficacy is maintained54 (QS 21). ES ranges from 0.41 to 0.56. No systemic side effects are reported. There is (1B) evidence for the efficacy and use of topical NSAIDs and capsaicin in the management of knee OA and these treatments have a good safety record. There is good evidence that NSAIDs are more efficacious than paracetamol for some patients, but the statement that they should be used in patients in whom paracetamol has failed, although attractive, does not have an evidence base. Unfortunately, there are no trials using failure of pain relief when treated with paracetamol as entry criteria for the trial. A few trials have directly compared paracetamol and NSAIDs. They have generally, but not exclusively, found that NSAIDs have better efficacy but increased gastrointestinal side effects. In a two year RCT44 (QS 23) paracetamol was compared with naproxen in 178 patients. Naproxen led to greater reductions in pain than paracetamol (ES 0.32 after 42 days and 0.45 after 730 days). Patient drop out was high (65%) owing to lack of efficacy in the paracetamol arm and to adverse events in the naproxen arm. A further trial of 382 patients comparing rofecoxib, celecoxib, and paracetamol demonstrated that more patients discontinued treatment early with paracetamol because of lack of efficacy and that significantly more pain relief was obtained with the coxibs than with paracetamol; side effect profiles were similar for all treatment arms56(QS 23). There has been speculation that COX 2 selective agents are more beneficial than conventional NSAIDs, particularly in those at higher risk of adverse gastrointestinal side effects. Large trials comparing COX 2 inhibitors with placebo and conventional NSAIDs have shown their superiority over placebo and a similar efficacy to conventional NSAIDs for pain relief but with a reduction—up to 50%—in perforation, ulcers, and bleeding. An RCT comparing celecoxib, diclofenac, and placebo in 600 patients over six weeks showed that both drugs were better than placebo in improving pain but showed no difference between active treatments. There were more gastrointestinal side effects with diclofenac than celecoxib and the coxib was better tolerated57 (QS21); there was an ES of 0.5 in comparison with placebo. A further study comparing varying doses of celecoxib with naproxen and placebo in 1003 patients found equal efficacy between the active treatment groups compared with placebo and an increased drop out rate in the placebo group due to lack of efficacy; in this study, however, the incidence of minor gastrointestinal related adverse events was similar for conventional NSAIDs and coxib, but one case of acute gastrointestinal bleeding occurred in the naproxen group58(QS25). Current reports show that cardiorenal adverse events occur equally in patients treated with non-selective NSAIDs and coxibs. A recent Cochrane review, including publications up to July 2002, examined the effectiveness of interventions for the prevention of NSAID induced upper gastrointestinal toxicity.59 This included 40 RCTs and concluded that all doses of misoprostol significantly reduced the risk of endoscopic ulcers. Standard doses of histamine-2 receptor antagonists effectively reduced the risk of endoscopic duodenal but not gastric ulcers. Double doses of histamine-2 receptor antagonists and protein pump inhibitors effectively reduced the risk of endoscopic duodenal and gastric ulcers, and were better tolerated than misoprostol. There is therefore (1A) evidence to support the use of NSAIDs in the treatment of knee OA. In those with an increased risk of gastrointestinal complications the evidence supports the use of either a COX 2 selective agent or the addition of a gastroprotective agent to a conventional NSAID. There is little direct evidence to fully support this statement. However, there is indirect evidence and the use of opioid analgesics is widely accepted in everyday clinical practice when other therapeutic options are limited. Indirect evidence would support that there is increased efficacy of pain control in those patients not entirely responsive to paracetamol and/or NSAIDs. It would be prudent, however, to counsel on the increased risk of adverse side effects, particularly in the elderly, and potential dependence when using this group of drugs. An RCT of 90 patients showed that treatment of knee OA with tramadol allowed reduction of the naproxen dose among those patients with naproxen-responsive pain60 (QS 19). There is therefore (1B) evidence to support this statement. SYSADOA is a generic term used for symptomatic slow acting drugs for OA, and includes glucosamine sulphate and related compounds, chondroitin sulphate, and diacerein. There is wide variability throughout Europe in the use of these drugs and how they are classified. In the United Kingdom, for instance, they are classified as a health food supplement rather than a prescribable drug, are available only over the counter, and are very widely self administered. Those SYSADOA (for example, glycosaminoglycan polysulphates) that are no longer in use throughout Europe have not been included in this analysis. The other products have been assessed individually. Both chondroitin sulphate and glucosamine sulphate have been the focus of a meta-analysis, including all studies up to 1999.61 This report concluded that trials of chondroitin and glucosamine compounds demonstrated moderate to large effects on pain and disability in OA compared with placebo; however, these effects may have been exaggerated by publication bias. These products are also safe and associated with few side effects. The ES calculated for chondroitin sulphate was 0.78 and for glucosamine 0.44 in this meta-analysis, where they combined all the studies. In an RCT assessing the efficacy of chondroitin sulphate compared with diclofenac in 146 patients, a prompter reduction of clinical symptoms was seen in patients treated with the NSAID, but these returned after the end of treatment; chondroitin, however, had a slower onset of action on the therapeutic response, but this lasted for up to three months after the end of treatment62 (QS20). A more recent RCT63(QS 27) demonstrated the benefit of chondroitin over placebo in 130 patients with knee OA and again showed persisting efficacy for up to one month after treatment. Two RCTs have compared the effect of glucosamine sulphate with ibuprofen. The first, conducted over an eight week period, showed that ibuprofen was more effective at decreasing pain scores within the first two weeks of treatment, but at eight weeks, glucosamine sulphate was significantly better64(QS 22). The second, conducted over four weeks, demonstrated that ibuprofen had a faster onset of action, but at four weeks the pain reduction and disability were similar65(QS 23). Two other placebo controlled RCTs have been published in addition to those assessed in the meta-analysis. Ninety eight older patients with moderate to severe knee OA showed no difference in pain or function with glucosamine sulphate compared with placebo over a two month period66 (QS 24). However, 106 patients with mild to moderate knee OA showed delayed progression of joint space loss and improvement in pain and function scores as compared with placebo over a three year period67(QS 26). This had led to the suggestion that glucosamine sulphate could be used as a structure modifying agent in knee OA. Only one RCT has examined the efficacy of glucosamine and chondroitin sulphate in combination; in 93 patients, those with mild to moderate knee OA had significant improvement in the Lequesne index of knee severity score at four and six months; those with severe disease had no improvement over placebo68(QS 24). An ES of 0.53–0.87 was calculated for glucosamine sulphate, excluding those used in the meta-analysis. Only one RCT of diacerein in patients with knee OA was identified. At doses of 100 mg daily, significant differences in pain and handicap scores were seen compared with placebo. At higher doses, a significant number of adverse events were seen69(QS 22). Studies examining possible predictors of response are few. Patients over 60 years with important functional impairment as documented by the Lesquesne index were associated with the greater efficacy of HA in one study76(QS 26). A retrospective study found that the response to HA was statistically influenced by structural severity of the knee OA—those with less severe disease did better, and those with an effusion at baseline did worse77(QS 18). It is noteworthy that most trials investigating intra-articular HA exclude severe OA. In summary, there is evidence to support the efficacy of HA in the management of knee OA both for pain reduction (1B) and functional improvement (1B). However, although pain relief may be obtained for several months, rather than for several weeks as with steroid, this benefit may be offset by its slower onset of action and by the requirement of a course of 3–5 weekly injections with the logistical and cost issues that that entails. There is minimal evidence for a role in disease modification. The term SYSADOA covers a range of agents. There is growing evidence to support the use of two of these agents for their symptomatic effects—namely, glucosamine sulphate (1A) and chondroitin sulphate (1A), but for the others the evidence is weak or absent. Intra-articular corticosteroid injections in knee OA have been used to relieve pain and inflammation for many years. The effects of steroids in knee OA have been assessed in a number of studies. One RCT concluded that steroid was more effective than placebo for pain relief over seven days (ES 1.27) in patients with knee OA, not all of whom had effusions78(QS 19). Another RCT involving 98 patients showed a significant difference in pain relief and functional outcomes between intra-articular steroid and placebo after one and four weeks but no difference at 12 and 24 weeks79(QS 24). One RCT involving 84 patients confirmed short term symptom benefit of steroid over placebo and found a better outcome in those with an effusion21(QS 22). However, a randomised crossover study of methylprednisolone versus saline found no clinical predictors of response, suggesting that steroid injection should not be reserved just for those with effusion alone22(17). In conclusion there is evidence (1B) that intra-articular injections of corticosteroid are effective but give relatively short lived benefit. The evidence for predictors of response, however, remains unclear and further studies are needed to answer this question. Joint replacement is an irreversible intervention used in those for whom other treatment modalities have failed and who generally have more severe disease. The effectiveness of total knee replacement (TKR) in knee OA has a well established place in those severely incapacitated. A systematic review concluded that TKR was a safe and effective treatment in improving quality of life,80 as well as reducing pain and improving function. The evidence base to support this statement is built wholly on class 3 evidence from observational and retrospective analyses, often using prosthesis survival as the primary outcome measure. A detailed review of surgery for knee OA identified 154 studies of 37 different tricompartmental prostheses in 9879 people (63% with osteoarthritis OA).81 Good or excellent outcomes for pain and function were reported in 89% of people up to five years after surgery. Unicompartmental and bicompartmental prostheses were also reviewed and showed similar findings. The review concluded that all forms of knee replacement improve quality of life. The general consensus among orthopaedic surgeons on indications for an operative procedure, carried out by a postal survey, were (a) severe daily pain and (b) x ray evidence of joint space narrowing.82 There are no evidence based guidelines to support this, however. No RCTs have compared TKR with non-surgical interventions. Although it is acknowledged that difficulties with study design may limit randomised studies on surgical treatments, there are areas that should be explored, including predictors of response, indications for joint replacement, and the effect of differences in surgical technique or joint prosthesis on long term outcomes. Moreover, postoperative outcome assessment should be carried out by an investigator independent of the surgeon who has performed the operation. These clinical recommendations are based on the updated evidence obtained by reviewing the literature up to and including February 2002. The publication also seeks to accommodate all commonly used treatment modalities used in knee OA. The data collected and provided are restricted to the knee only, therefore, and those papers in which summary statistics could not be dissected from the other non-knee data were excluded. Equally, current recommendations cannot be extrapolated to OA at other sites. The main purpose of the paper is to act as a resource document for secondary care, with the aim that each individual country should use the information generated to produce their own set of management guidelines and algorithms for treatment in primary care. As noted in the 2000 recommendations, there is often discordance between expert opinion and trial evidence, confirming that our own experience and local situations are important in determining individual treatment selection. Reviewing the literature has reinforced the need to investigate predictors of response to individual treatments as the information relating to this important aspect is limited. Also, there is a lack of information about pooled/combination treatments, which would reflect everyday clinical practice. We still remain ignorant about the difference between efficacy (trial data) and clinical effectiveness (how useful in practice) for many of these treatments. A heterogeneous array of outcome measures was used which makes comparison between different publications using the same treatment difficult. A more standardised way of assessing the various treatments needs to be adopted internationally. The task force attempted to review the evidence for efficacy of individual treatments and to give an additional more subjective summary of expert opinion on the overall safety and usefulness. The task force made no attempt to design a more didactic algorithm for management, even though it was realised that such a simplistic approach might have more immediate impact on the behaviour of health professionals. Many patient centred factors are important in determining the selection of treatments for individual patients with knee OA—for example, psychosocial factors and OA status; comorbid disease and drugs; patient beliefs about their knee OA; patient beliefs and preferences for its management; and previous patient experiences of treatments and health professionals. The costs and logistics of delivering specific interventions (for example, physiotherapy, weekly knee injections of HA) are also important. Therefore the management plan for patients with knee OA has to be individualised, reviewed, and adjusted in the light of the patient’s response and adherence and will vary between patients and between locations. Optimistically, however, the findings of the current EULAR Recommendations show that there is a wide variety of treatments from which to choose for people with knee OA. There is no single right and wrong approach and each health professional must decide with each patient the most appropriate management plan at a particular time and for that location. It is hoped that discussion within healthcare provider groups of the treatment options outlined in this document will improve knowledge and interest in the management of knee OA and result in higher standards of care. We thank Bristol Myers Squibb and, in particular, Dr Manuela Le Bars, for financial and logistical support. Peat G, McCarney R, Croft P. Knee pain and osteoarthritis in older adults: a review of community burden and current use of health care. Ann Rheum Dis2001;60:91–7. Guccione AA, Felson DT, Anderson JJ, Anthony JM, Zhang Y, Wilson PW, et al. The effects of specific medical conditions on the functional limitations of elders in the Framingham study. Am J Publ Health1994;84:351–8. Murray CJL, Lopez AD. The global burden of disease. Geneva: World Health Organisation, 1997.
Cooper C. Epidemiology of osteoarthritis. In: Klippel JH, Dieppe PA, eds. Rheumatology, 2nd ed. London: Mosby, 1998:1–20. Dieppe P, Basler HD, Chard J, Croft P, Dixon J, Hurley M, et al. Knee replacement surgery for osteoarthritis: effectiveness, practice variations, indications and possible determinants of utilisation. Rheumatology (Oxford)1999;38:73–83. Felson DT. Osteoarthritis new insights. Part 1: the disease and its risk factors. Ann Intern Med2000;133:637–9. Cooper C, Snow S, McAlindon TE, Kellingray S, Stuart B, Coggon D, et al. Risk factors for the incidence and progression of radiographic knee osteoarthritis. Arthritis Rheum2000;43:995–1000. Spector TD, Cicuttini F, Baker J, Loughlin J, Hart D. Genetic influences in women: a twin study. BMJ1996;312:940–3. Scott DL. Guidelines for the diagnosis, investigation and management of osteoarthritis of the hip and knee. Report of a Joint Working Group of the British Society for Rheumatology and the Research Unit of the Royal College of Physicians. J R Coll Physicians Lond1993;27:391–6. American College of Rheumatology subcommittee on osteoarthritis guidelines. Recommendations for the medical management of osteoarthritis of the hip and knee. Arthritis Rheum2000;43:1905–15. Downs SH, Black N. The feasibility of creating a checklist for the assessment of the methodological quality both of randomised and non-randomised studies of health care interventions. J Epidemiol Community Health1998;52:377–84. Schwarzer R. Meta-analysis programs version 5.0 Berlin, Germany: Ralf Schwarzer Computer Programs for Meta-Analysis 2000 (www.fuberlin.de/gesund/meta_e.htm). Cohen J. Statistical power analysis for the behavioural sciences. New York: Academic Press, 1977. Petrella RJ, Bartha C. Home based exercise therapy for older patients with knee osteoarthritis: a randomised controlled trial. J Rheumatol2000;27:2215–21. Deyle GD, Henderson NE, Matekel RL, Ryder MG, Garber MB, Allison S. Effectiveness of manual physical therapy and exercise in osteoarthritis of the knee: a randomised controlled trial. Ann Intern Med2000;132:173–81. Messier SP, Loeser RF, Mitchell MN, Valle G, Morgan TP, Rejeski WJ, et al. Exercise and weight loss in obese older adults with knee osteoarthritis: a preliminary study. J Am Geriatr Soc2000;48:1062–72. Mazzuca SA, Brandt KD, Katz BP, Chambers M, Byrd D, Hanna M. Effects of self-care education on the health status of inner-city patients with osteoarthritis of the knee [see comments]. Arthritis Rheum1997;40:1466–74. Tohyama H, Yasuda K, Kaneda K. Treatment of osteoarthritis of the knee with heel wedges. Int Orthop1991;15:31–3. Sasaki T, Yasuda K. Clinical evaluation of the treatment of osteoarthritic knees using a newly designed wedged insole. Clin Orthop1985;221:181–7. Gaffney VK, Ledingham J, Perry JD. Intra-articular triamcinolone hexacetonide in knee osteoarthritis: factors influencing the clinical response. Ann Rheum Dis1995;54:379–81. Jones A, Doherty M. Intra-articular corticosteroids are effective in osteoarthritis but there are no clinical predictors of response. Ann Rheum Dis1996;55:829–32. Mazzuca SA, Brandt KD, Katz BP, Hanna MP, Melfi CA. Reduced utilisation and cost of primary care clinic visits resulting from self-care education for patients with osteoarthritis of the knee. Arthritis Rheum1999;42:1267–73. Weinberger M, Tierney WM, Booher P, Katz BP. Can the provision of information to patients with osteoarthritis improve functional status? A randomised, controlled trial. Arthritis Rheum1989;32:1577–83. Maurer BT, Stern AG, Kinossian B, Cook KD, Schumacher HR Jr. Osteoarthritis of the knee: isokinetic quadriceps exercise versus an educational intervention. Arch Phys Med Rehabil1999;80:1293–9. Keefe FJ, Caldwell DS, Williams DA, Gil KM, Mitchell D, Robertson C, et al. Pain coping skills training in the management of osteoarthritic knee pain-II: follow-up results. Behavior Therapy1990;21:435–47. Keefe FJ, Caldwell DS, Baucom D, Salley A, Robinson E, Timmons K, et al. Spouse-assisted coping skills training in the management of knee pain in osteoarthritis: long-term followup results. Arthritis Care Res1999;12:101–11. Penninx BWJH, Messier SP, Rejeski WJ, Williamson JD, DiBari M, Cavazzini C, et al. Physical exercise and the prevention of disability in activities of daily living in older persons with osteoarthritis. Arch Intern Med2001;161:2309–16. Baker KR, Nelson ME, Felson DT, Layne JE, Sarno R, Roubenoff R, et al. The efficacy of home based progressive strength training in older adults with knee osteoarthritis: A randomised controlled trial. J Rheumatol2001;28:1655–65. O’Reilly SC, Muir KR, Doherty M. Effectiveness of home exercise on pain and disability from osteoarthritis of the knee: a randomised controlled trial. Ann Rheum Dis1999;58:15–19. Mangione KK, McCully K, Gloviak A, Lefebvre I, Hofmann M, Craik R. The effects of high-intensity and low intensity cycle ergometry in older adults with knee osteoarthritis. J Gerontol A Biol Sci Med Sci1999;54:M184–90. Fransen M, Crosbie J, Edmonds J. Physical therapy is effective for patients with osteoarthritis of the knee: a randomised controlled clinical trial. J Rheumatol2001;28:156–64. Wyatt FB, Milam S, Manske RC, Deere R. The effects of aquatic and traditional exercise programs on persons with knee osteoarthritis. J Strength Cond Res2001;15:337–40. Kirkley A, Webster-Bogaert S, Litchfield R, Amendola A, MacDonald S, McCalden R, et al. The effect of bracing on varus gonarthrosis. J Bone Joint Surg Am1999;81:539–48. Maillefert JF, Hudry C, Baron G, Kieffert P, Bourgeois P, Lechavalier D, et al. Laterally elevated wedged insoles in the treatment of medial knee osteoarthritis: a prospective randomized controlled study. Osteoarthritis Cartilage2001;9:738–45. Crenshaw SJ, Pollo FE, Calton EF. Effects of lateral wedged insoles on kinetics at the knee. Clin Orthop2000;375:185–92. Hassan BS, Mockett S, Doherty M. Influence of elastic bandage on knee pain, proprioception, and postural sway in subjects with knee osteoarthritis. Ann Rheum Dis2002;61:24–8. Felson DT, Zhang Y, Anthony JM, Naimark A, Anderson JJ. Weight loss reduces the risk for symptomatic knee osteoarthritis in women. The Framingham Study. Ann Intern Med1992;116:535–9. Amadio P, Cummings DM. Evaluation of acetaminophen in the management of osteoarthritis of the knee. Cur Ther Res1983;34:59–66. Bradley JD, Brandt KD, Katz BP, Kalasinski LA, Ryan SI. Treatment of knee osteoarthritis: relationship of clinical features of joint inflammation to the response to a nonsteroidal antiinflammatory drug or pure analgesic. J Rheumatol1992;19:1950–4. Bradley JD, Katz BP, Brandt KD. Severity of knee pain does not predict a better response to an antiinflammatory dose of ibuprofen than to analgesic therapy in patients with osteoarthritis. J Rheumatol2001;28:1073–6. Williams HJ, Ward JR, Egger MJ, Neuner R, Brooks RH, Clegg DO, et al. Comparison of naproxen and acetaminophen in a two-year study of treatment of osteoarthritis of the knee. Arthritis Rheum1993;36:1196–206. Abramson SA. Et tu acetaminophen? Arthritis Rheum2002;46:2831–5. Grace D, Rogers J, Skeith K, Anderson K. Topical diclofenac versus placebo: a double blind, randomised clinical trial in patients with osteoarthritis of the knee. J Rheumatol1999;26:2659–63. Dreiser RL, Tisne-Camus M. DHEP plasters as a topical treatment of knee osteoarthritis–a double blind placebo-controlled study. Drugs Exp Clin Res1993;19:121–7. Sandelin J, Harilainen A, Crone H, Hamberg P, Forsskahl B, Tamelander G. Local NSAID gel (eltenac) in the treatment of osteoarthritis of the knee. A double blind study comparing eltenac with oral diclofenac and placebo gel. Scand J Rheumatol1997;26:287–92. Ottilinger B, Gomor B, Michel BA, Pavelka K, Beck W, Elsasser U. Efficacy and safety of eltenac gel in the treatment of knee osteoarthritis. Osteoarthritis Cartilage2001;9:273–80. Waikakul S, Penkitti P, Soparat K, Boonsanong W. Topical analgesics for knee arthrosis: a parallel study of ketoprofen gel and diclofenac gel. J Med Assoc Thai1997;80:593–7. Dickson DJ. A double blind evaluation of topical piroxicam gel with oral ibuprofen in osteoarthritis of the knee. Curr Ther Res1991;49:199–207. Newbery R, Shuttleworth P, Rapier C. A multicentre post marketing surveillance study to evaluate the safety and efficacy of felbinac 3% gel in the treatment of musculoskeletal disorders in general practice. Eur J Clin Res1992;3:139–50. Evans JMM, McMahon AD, McGilchrist MM, White G, Murray FE, McDevitt DG, et al. Topical non-steroidal anti-inflammatory drugs and admission to hospital for upper gastrointestinal bleeding and perforation: a record linkage case control study. BMJ1995;311:22–6. Deal CL, Schnitzer TJ, Lipstein E, eibold JR, Stevens RM, Levy MD, et al. Treatment of arthritis with topical capsaicin: a double-blind trial. Clin Ther1991;13:383–95. Watson MC, Brookes ST, Kirwan JR, Faulkner A. Non-aspirin, non-steroidal anti-inflammatory drugs for treating osteoarthritis of the knee (Cochrane review). In: The Cochrane Library, Issue 1. Oxford: Update Software, 2002. Geba GP, Weaver AL, Polis AB, Dixon ME, Schnitzer TJ. Efficacy of rofecoxib, celecoxib, and acetaminophen in osteoarthritis of the knee. JAMA2002;287:64–71. McKenna F, Borenstein D, Wendt H, Wallemark C, Lefkowith JB, Geis GS. Celecoxib versus diclofenac in the management of osteoarthritis of the knee. Scand J Rheumatol2001;30:11–18. Bensen WG, Fiechtner JJ, McMillen JI, Zhao WW, Yu SS, Woods EM, et al. Treatment of osteoarthritis with celecoxib, a cyclo-oxygenase-2 inhibitor: a randomised controlled trial. Mayo Clin Proc1999;74:1095–105. Rostom A, Dube C, Wells G, Tugwell P, Welch V, Jolicoeur E, et al. Prevention of NSAID induced gastroduodenal ulcers (Cochrane review). In: The Cochrane Library, Issue 1. Oxford: Update software, 2003. Schnitzer TJ, Kamin M, Olson WH. Tramadol allows reduction of naproxen dose among patients with naproxen-responsive osteoarthritis pain. Arthritis Rheum1999;42:1370–7. McAlindon TE, LaValley MP, Gulin JP, Felson DT. Glucosamine and chondroitin for treatment of osteoarthritis: a systematic quality assessment and meta-analysis. JAMA2000;283:1469–75. Morreale P, Manopulo R, Galati M, Boccanera L, Saponati G, Bocchi L. Comparison of the antiinflammatory efficacy of chondroitin sulphate and diclofenac sodium in patients with knee osteoarthritis. J Rheumatol1996;23:1385–91. Mazieres B, Combe B, Phan Van A, Tondut J, Grynfeltt M. Chondroitin sulphate in osteoarthritis of the knee: a prospective, double blind, placebo-controlled multicenter clinical study. J Rheumatol2001;28:173–81. Vaz AL. Double blind clinical evaluation of the relative efficacy of ibuprofen and glucosamine sulphate. I The management of osteoarthritis of the knee in outpatients. Curr Med Res1982;8:145–9. Muller-Fassbender H, Bach GL, Haase W, Rovati LC, Setnikar I. Glucosamine sulphate compared to ibuprofen in osteoarthritis of the knee. Osteoarthritis Cartilage1994;2:61–9. Rindone JP, Hiller D, Collacott E, Nordhaugen N, Arriola G. Randomised, controlled trial of glucosamine for treating osteoarthritis of the knee. West J Med2000;172:91–4. Reginster JY, Deroisy R, Rovati LC, Lee RL, Lejeune E, Bruyere O, et al. Long-term progression of glucosamine sulphate on osteoarthritis progression: a randomised, placebo-controlled clinical trial. Lancet2001;357:251–6. Das A Jr, Hammad TA. Efficacy of a combination of FCHG49™ glucosamine hydrochloride, TRH122™ low molecular weight chondroitin sulphate and manganese ascorbate in the management of knee osteoarthritis. Osteoarthritis Cartilage2000;8:343–50. Pelletier JP, Yaron M, Haraoui B, Cohen P, Nahir MA, Choquette D, et al. Efficacy and safety of diacerein in osteoarthritis of the knee. A double blind, placebo controlled trial. Arthritis Rheum2000;43:2339–48. Wobig M, Bach G, Beks P, Dickhut A, Runzheimer J, Schwieger G, et al. The role of elastoviscosity in the efficacy of viscosupplementaion for osteoarthritis of the knee: A comparison of hylan G-F 20 and a lower molecular weight hyaluronan. Clin Ther1999;21:1549–62. Dougados M, Nguyen M, Listrat V, Amor B. High molecular weight sodium hyaluronate (hyalectin) in osteoarthritis of the knee: a 1 year placebo controlled trial. Osteoarthritis Cartilage1993;1:97–103. Corrado EM, Peluso GF, Gigliotti S, De Durante C, Palmieri D, Savoia M, et al. The effects of intra-articular administration of hyaluronic acid on osteoarthritis of the knee: A clinical study with immunological and biochemical evaluations. Eur J Rheumatol Inflamm1995;15:47–56. Huskisson EC, Donnelly S. Hyaluronic acid in the treatment of osteoarthritis of the knee. Rheumatology (Oxford)1999;38:602–7. Carrabba M, Paresce E, Angelini M, Perbellini A. The safety and efficacy of different dose schedules of hyaluronic acid in the treatment of painful osteoarthritis of the knee with joint effusion. Eur J Rheumatol Inflamm1995;15:25–31. Listrat V, Ayral X, Patarnello F, Bonvarlet JP, Simonnet J, Amor B, et al. Arthroscopic evaluation of potential structure modifying activity of hyaluronan (Hyalgan) in osteoarthritis of the knee. Osteoarthritis Cartilage1997;5:153–60. Lohmander LS, Dalen N, Englund G, for the Hyaluronan Multicentre Trial Group. Intra-articular hyaluronan injections in the treatment of osteoarthritis of the knee: a randomised, double blind, placebo-controlled multicentre trial. Ann Rheum Dis1996;55:424–31. Lussier A, Cividino AA, McFarlane CA, Olszynski WP, Potashner WJ, De Medicis R. Viscosupplementation with Hylan for the treatment of osteoarthritis: findings from clinical practice in Canada. J Rheumatol1996;23:1579–85. Dieppe PA, Sathapatayavongs B, Jones HE, Bacon PA, Ring EF. Intra-articular steroids in osteoarthritis. Rheumatol Rehabil1980;19:212–17. Ravaud P, Moulinier L, Giraudeau B, Ayral X, Guerin C, Noel E, et al. Effects of joint lavage and steroid injection in patients with osteoarthritis of the knee. Results of a multicenter, randomised, controlled trial. Arthritis Rheum1999;42:475–82. Frankel S, Williams M, Nanchahal K, Coast J. Epidemiologically based needs assessment: total hip and knee joint replacement. HCEU report for the Department of Health, University of Bristol, 1990. Chard J, Lohmander S, Smith C, Scott D. Osteoarthritis. In: Godlee F, ed. Clinical evidence. A compendium of the best evidence for effective health care. London: BMJ Publishing Group, 2002; issue 8 :1212–37. Manusco CA, Ranwat CS, Esdaile JM, Johanson NA, Charlson ME. Indications for total hip and total knee arthroplasties. Results of orthopaedic surveys. J Arthroplasty1996;1:34–46.